Ireland have been dealt a tough blow ahead of the U20 World Cup after two of their star forwards were ruled out of the tournament after suffering knee injuries. 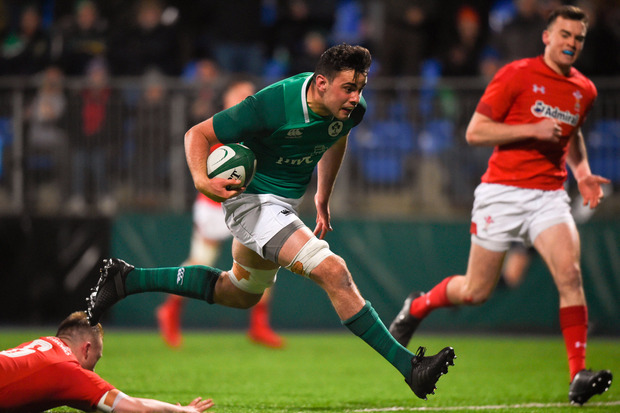 Munster back row Jack O'Sullivan was arguably Ireland's player of the Six Nations, but won't take any part after injuring his cruciate ligament in training last week. Prop Tom O'Toole also hurt his knee in action for Ulster in their Champions Cup playoff against the Ospreys last Sunday. Garryowen back row Jack Daly will replace O'Sullivan, while UCC prop Bryan O'Connor has been called up to cover O'Toole. Ireland get their campaign underway against France at 8pm next Wednesday in Perpignan. They then face South Africa on Sunday June 3rd at 3.30pm and Georgia on Thursday June 7 at 5.30pm. Both games take place in Narbonne.